IN 1873 A TRIO OF FOUNDERS of the tiny town of Spokane Falls – including Salem, Oregon's James Glover – acquired ownership of a 158-acre tract located at the center of today's Spokane. After building a saw mill near the town's namesake waterfalls, he eventually donated about 40 prime acres (from Front Avenue to Broadway Avenue, Post Street to Monroe Street) to Frederick Post for the establishment of a flour mill. The one-square-block of that parcel which he retained is where the grand Auditorium Theater was built (NW corner of W. Main Avenue & N. Post Street) in the aftermath of the Great Fire of August 1889. The seven-story, 1,750-seat Auditorium Theater opened in 1890, boasting an impressive exterior, an over-sized stage, three balconeys, deluxe loge seating, & eventually a house orchestra which was led for years by noted cellist, Ferdinand Sorenson. 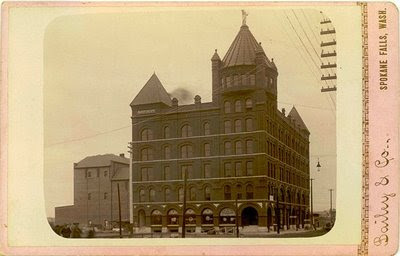 The facility was welcomed by Spokane's early residents – as well as touring musicians & entertainers (ranging from Sarah Bernhardt to Al Jolson) who presumably appreciated such a fine outpost of genteel culture out here in the Wild West. When the motion picture industry finally overtook old-school vaudevillian entertainments in the 1920s, the Auditorium added a "silver screen," but time was running out and the hall was razed in 1934. Today River Park Square marks the historic site.